We woke up in the morning, and John, Victoria, William, and Douglas went swimming in the indoor pools. Yesterday the temperature was cool; it fluctuated between 18 C and 29 C. When we camped at Bluewater Lake State Park outside Mesita, New Mexico, it was cool also. We had to wear a light jacket while we set up the tent and we actually had to sleep in our sleeping bags. After we had a swim, we all had showeres and then drove to Price, Utah to find a laundromat. It took a little over an hour to do our laundry. While our clothes washed and dried, we played Uno (card game) and updated our travel blog on the computer. Then we made our lunch, using the topper on the trailer as our table and counter. We ate deli meat sandwiches with tomato, lettuce, cheese and green pepper and cookies and apples. We ate cheerios and grapes for breakfast in the motel. Now we are on our way to Salt Lake City at 1:00pm. Entered Provo, Utah at 2:26pm. We walked around the Provo Temple. 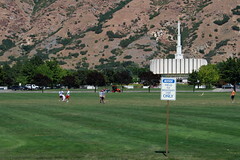 We saw the MTC (Missionary Training Center) and BYU. There were lots of missionaries around the MTC. 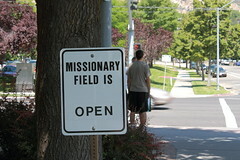 And we saw a sign which read “The Mission Field is Open.” We looked across the street atnd there was a soccer field especially for missionaries. We walked around the block at the MTC and I ran into a metal pole that was collarbone height. I didn’t see it because I was looking at houses across the street. After, we drove to Salt Lake City and drove around Temple Square. It was rush hour and the roads were crazy. We stopped at an Information Centre across from the Utah State Capital Building (very impressive). William needed a bathroom, but the Info Centre was closed. Luckily there was a port-a-potty nearby. Someone in the Visitor’s Center recommented Little Cottonwood Canyon Campground. We started out and then realized it was too far away. We looked up a KOA and found it was close to Temple Square. We got the last tent site and rented it for 2 nights. It was also the smallest tent site and it was quite a challenge to fit our tent, the picnic table and van in the confined space. The KOA also informed us there is a daily shuttle bus every half hour to Temple Square. We were happy about that so we wouldn’t have to deal with traffic and parking. We made dinner at our campsite at 8pm. We had canned stew with instant potatoes on top, green beans and bread and butter. following dinner, John and Douglas went for a swim at the pool.